← What’s The Point Of Calculating Our Latitude From The Altitude Of The Sun At Midday? This post continues the series Finding Stars and Constellations. Lyra, Cygnus and Aquila – The Summer Triangle. 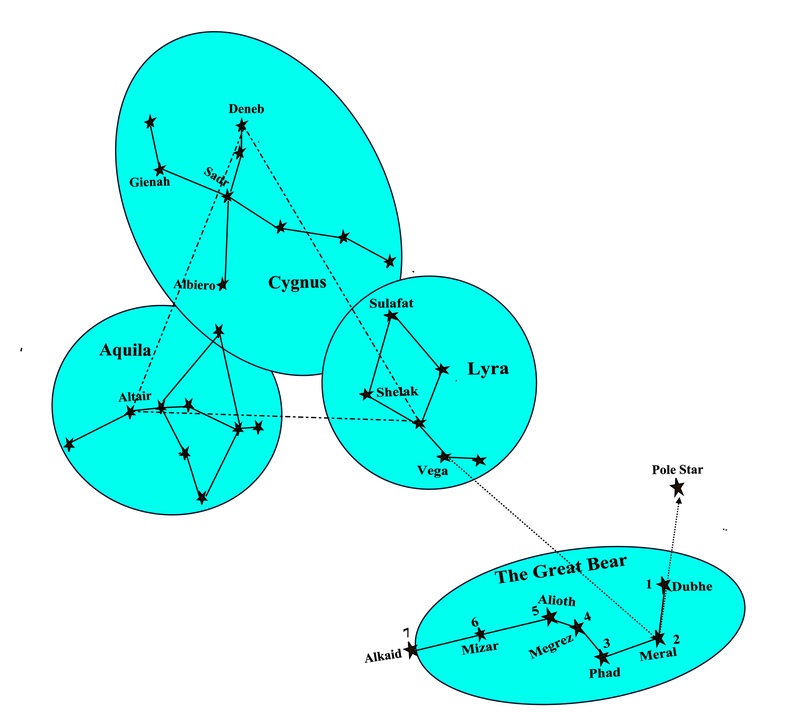 The diagram below shows the constellations Lyra, Cygnus and Aquila. If we follow the reference line ‘the Pointers’ from Ursa Major to Polaris, Vega, the brightest star in Lyra, can be found at about one hand-span from Polaris. An alternative method is to join star 2 of Ursa Major to a point midway between stars 1 and 4 and this line, when extended, will point to Vega. To the left of Lyra, at about a hand-span and at a slightly lower altitude, we will find the star Altair in the constellation Aquila. The constellation Cygnus can be found slightly above a point midway between Lyra and Aquila. The Summer Triangle. The stars Deneb in the constellation Cygnus, Altair in Aquilla and Vega in Lyra form an astronomical asterism which is known as the ‘Summer Triangle’. 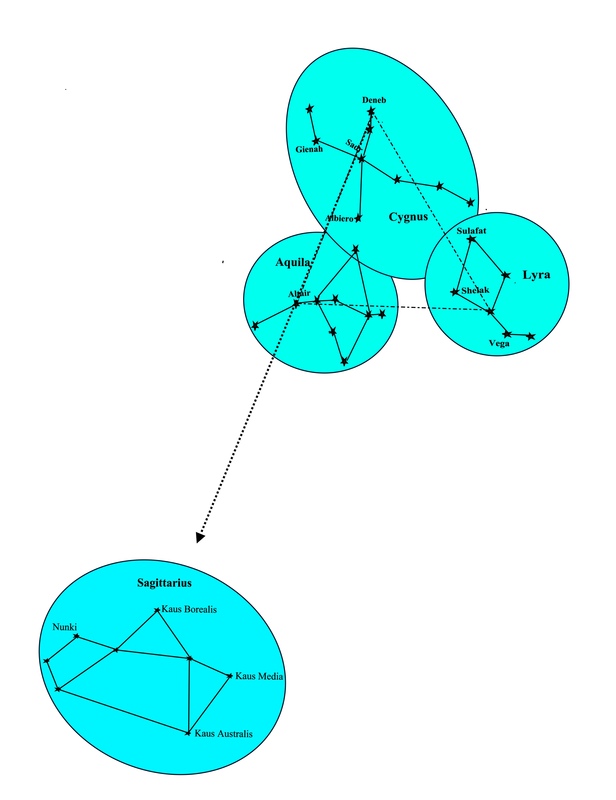 The diagram shows how the triangle is formed by imaginary lines drawn between these stars. An alternative name given to this asterism by U.S. Air force pilots is the ‘Navigator’s Triangle’ because it’s bright stars provide a beacon in the sky. The triangle is also popular with ‘seagoing’ navigators because it provides pointers to several constellations. Sagittarius The Archer Sagittarius is a large constellation lying over the southern hemisphere and is visible between latitudes +55 and -90. For navigation purposes, it is best seen during evening nautical twilight in August. It contains several bright stars, two of which, Nunki and Kaus Australis, are navigation stars. In ancient Greek mythology, Sagittarius was said to represent the Archer, a beast called a Centaur which was half man and half horse. In the representation, the Archer has a drawn bow with the arrow pointing to the star Antares, the heart of the scorpion which had been sent to kill Orion. Finding Sagittarius. The Summer Triangle provides a useful pointer to Sagittarius. If we draw an imaginary line from the star Deneb through the star Altair in the Summer Triangle, and extend that line by about 20o or one hand-span, it will point to the constellation Sagittarius as the diagram below shows. Note. Nowadays, the Sun is over the constellation Sagittarius at the Winter Solstice on 21/22 December when the Sun’s declination reaches its southernmost latitude of 23.5o south. However, in ancient Greek times, the Sun passed through the constellation Capricornus at this time hence the reason for naming the latitude 23.5o south the Tropic of Capricorn. Scorpius (Scorpio) The Scorpion The constellation Scorpius lies above the southern hemisphere and is visible between latitudes +40 to -90. For navigation purposes, it is best seen during evening nautical twilight in July. Scorpius has several bright stars which, between them, form the shape of a scorpion. The brightest star in Scorpius is Antares which is often mistaken for Mars because of its redish orange colour. Antares is the 16th. brightest star in the sky and is a navigation star. The second brightest star in Scorpius is Shaula which is said to represent the sting in the tail of the scorpion. Shaula is also navigation star. In Greek mythology, Scorpius represents the scorpion that the goddess Artemis sent to sting and kill Orion who had tried to ravish her. Finding Scorpius. The legend that the Archer’s arrow in Sagittarius points to the heart of Antares helps us to find and identify Scorpius. 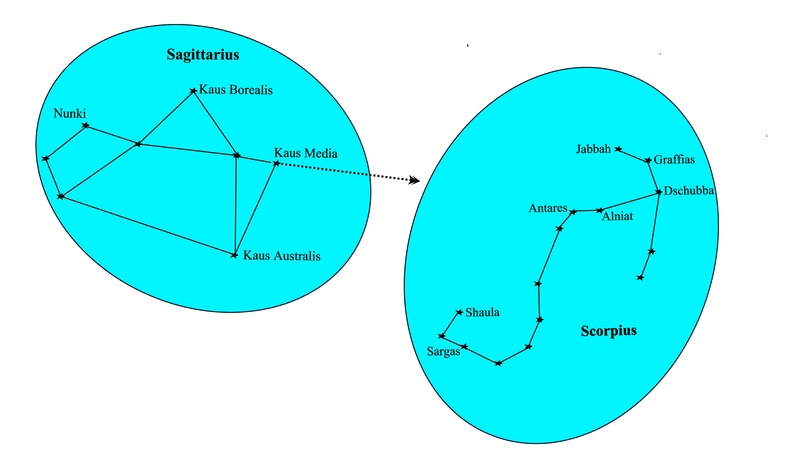 The line from Nunki to Kaus Media represents the arrow, the head of which points to Antares in Scorpio which is to the right of Sagittarius. It also helps to remember that the orange star Kaus Media, points towards the red star Antares . The bright red glow of Antares further helps us to identify Scorpius. The angular distance from Kaus Australis in Sagittarius to Shaula in Scorpio is approximately 10o or roughly equivalent to the width of the palm of the hand when held at arms length. Notes. Star maps can be very confusing because they are not drawn in the conventional way with east on the right and west on the left. They are drawn as they would appear in the sky if we were lying down with our legs pointing to the south and looking upwards so that east would be on the left and west on our right. Although this series of posts show the locations of certain constellations relative to other constellations in the sky, it does not necessarily indicate whether or not a certain constellation will be visible above the horizon. That will of course depend on its times of rising and setting at the position of the observer. ‘Risings and Settings’ will be the subject of another post. Watch out for the next post in this series which will be issued shortly.